For a lot of people, a family holiday is incomplete without the accompaniment of their four-legged friends. And with more pet-friendly holidays available now than ever before, travelling with pets is becoming increasingly popular. 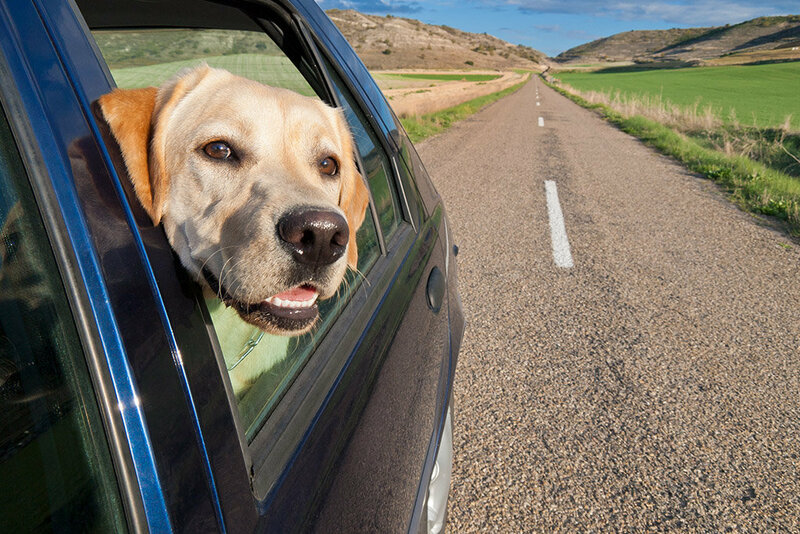 A holiday road-trip is stressful enough without having to worry about the safety of your pets, but with the right preparations, taking them along with you can make for a truly memorable road trip! Make sure, before hitting the road, that you have all the necessary items your pet will need for a fuss-free journey. Any form of identification is important if your pup runs off, cat makes a quick escape, or bird takes to the sky, without anyone knowing who they are or where they came from. Bring enough food for the trip, and the type they’re already accustomed to, as well as plenty of water to keep them hydrated. Blankets are always a good idea especially in the winter months, and of course disposable baggies for parking lot rest stops. Taking a few old cloths along helps for muddy paws on your back seat, and with Tata’s leather seat offering, a simple wipe is all it takes. Contrary to popular belief, allowing your pet to travel with their head hanging out the window isn’t the safest idea, as they could be injured by flying objects or other vehicles travelling too close. Depending on the size of your pet, it’s often a good idea to keep them in a well-ventilated crate or carrier. Make sure however, that it’s one that your pet can sit, stand, lie, or fly around in. Our XENON double-cab bakkies are not only great for lengthy road trips, but also have ample space in the back for these carriers. Other ways to ensure your pet is safely restrained in your vehicle is with the use of a pet safety harness that clips onto your back seat, or a pet car seat. These are great options if you’re travelling in one of our Tata sedan passenger vehicles, such as the Manza, equipped with more than enough back-seat room. A safety harness works similarly to a seatbelt, and while most pups become accustomed to it fairly quickly, you may want to let them wear it by itself a few times before hitting the road. Similarly, with the car seat, it’s always a good idea to take them on a series of short drives first, gradually lengthening their time in the car. When taking to the road it’s important to always stop for a quick break or two. The same applies when you have a pet in the car. Travelling with pets is a lot like travelling with a child; they need to be able to get out, stretch their legs and do their business every now and then. If you’re lucky enough to have a pet that doesn’t stir throughout the whole trip, this doesn’t mean the need to stop every so often isn’t there. Travelling with pets involves a lot more than simply loading them in the back and heading to your holiday destination. The more homework you do on safe pet travel, the fewer surprises there will be along the way. Applying these safety precautions will make for a much more enjoyable, stress-free road trip that’ll pave the way for a fun-filled family holiday!